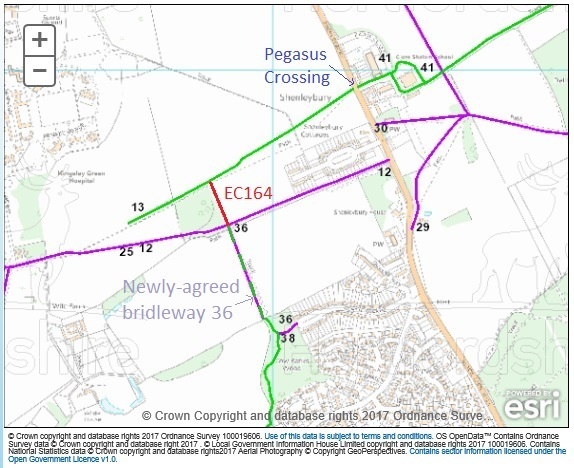 The route from Bridleway Shenley 36/38 at Cow Banks Wood to Shenley 12 has now received the consent of all those who needed to agree to its upgrade from footpath (and permissive bridleway) to public bridleway. This is fantastic news and means that just 100 yards or so (shown on this diagram as EC164 to the north of the newly agreed bridleway) remain to be formalised to complete the 8 mile Shenley Parish Ride. 31 Mar 17: Landowner advises permissive waymarks changed to 'public brdleway' waymarks in preparation for eth official opening. Please email trust@pgbt.org.uk if you would like to be invited to the 'official opening' towards the end of May 2017. 24 Mar 17: All agreements needed to upgrade to BW have been received. Recording details will be posted once the process is complete.